I still am pinching myself. It's done. I've pushed send. No more staying up all night working on it. No more whining to my alleycat friends, my mom and my husband. I FINISHED MY FIRST REAL CONTRACTED EDITS. My edits were extensive. They required a pretty decent rewrite and some big changes, so much so that part of me is saying, "Why the heck did they want to publish this in the first place???" But they did, and I tried my best on the edits, and that's all we can do, hm? I would not be surprised in the least if they come back with more changes needed. And as long as that is after Christmas, I'm totally good with that! My desire is for my first book to be the BEST that I can possibly make it. She even down to the wire, read 70 pages that last day. I still need to catch up on sleep. The last few weeks I've stayed up late most nights, but Monday night, I didn't go to bed until 4 a.m., as I needed to have them DONE so I could spend Tuesday doing one last read through. Said read through took me all day Tuesday, as well as all night, until 6:09 a.m. when I was able to push that blurry send button. And Christmas... I've put off "baking" with my kids so many times, that I know they are wondering, "are we actually going to do some today?" 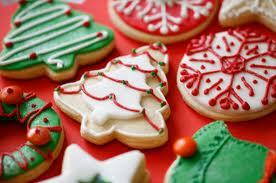 as today is the day I've promised we'd inundate ourselves with Christmas cookies. Yes, my children, TODAY IS THE DAY, because... edits are DONE! Oh, and there is the little issue that I have yet to wrap even ONE of my children's presents. They are getting worried... we usually start putting them under the tree about two weeks before Christmas, and they trickle with more and more. Santa, of course, brings one big gift Christmas morning. Considering we have 4 kiddos... that's a LOT of presents to wrap. But, I'm determined to enjoy these last few days before Christmas. Today, we PARTY!!!! It's an edits-are-finished party and Christmas cookies all around to celebrate! Discussion: What's your FAVORITE type of Christmas cookie??? So, I guess congratulations are in order. Wishing you a Blessed Christmas and apublished book in the New Year! Congratulations Krista!!!!!!!!!!! You amaze me, you really do. I would have been a basket case if I were in your shoes. Seriously...you never cease to amaze me. And HUGE KUDOS to Sarah!!!! Way to go! So relax, have fun, enjoy the family, and have a BLESSED Christmas. Congrats, Crista - and WOWOWOW to Sarah! Excited for you! And Sarah- you are AWESOME! Your critiques are truly pay-worthy. Krista--your joy spills onto the page today, and I'm so happy for you. :) Congratulations on getting the first round of edits done. You deserve to have a baking day, and time to catch up on sleep. May your Christmas be filled with laughter and joy! You made a difficult task real, yet inspiring for us. Wow Krista--it's done...you did it. I'm so happy for you..and totally can't wait to see the book in print. Congratulations on completing your edits, Krista! Hope you've caught up on your sleep. And yay for Superwoman Sarah reading for you. What a supportive friend! Congratulations! An awesome accomplishment. Hope you enjoyed your Christmas!! I used to bake cut-out Sand Tarts, topped with a dab of whipped egg white and almond slivers and sprinkled with sugar and cinnamon. Crunchy and delicious!